Road Angel Compact (discontinued) smallest Road Angel ever! The Road Angel Compact speed camera detector is the entry level Road Angel product giving you access to the UK's No 1 safety camera and accident blackspot database. Utilising GPS technology, Road Angel Compact alerts you to: accident blackspots and safety cameras (including Gatso, Truvelo, SPECS, Watchman, Speedcurb, DS2), with an audible and visual alert. Road Angel Compact has been discontinued. The Road Angel Compact speed camera detector acts as an extra pair of eyes to keep you alert to approaching danger and improves the safety of every journey. It is very simple to install and update. The Road Angel Compact GPS system requires the additional clip-on Laser Detector/Alert module to detect Safety Camera vans and hand held roadside laser speed measurement guns. Easy to install using the suction cup bracket provided. 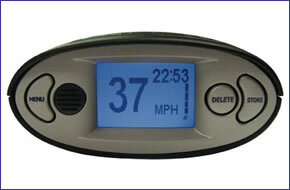 The Road Angel Compact is designed to provide all the information at a glance, portable and robust.